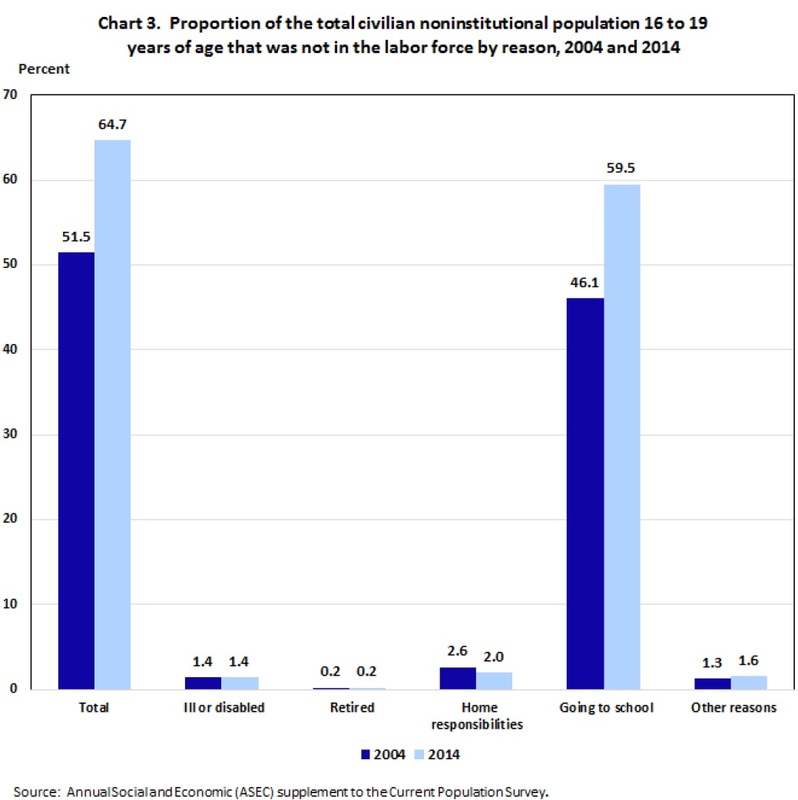 CONVERSABLE ECONOMIST: Why Do People Say They Aren't In the Labor Force? Although the unemployment rate has dropped to 5%, the labor force participation rate has continued its long-term decline. For those not clear on the difference in these terms, the government only counts people as unemployed if they are both without a job and also looking for a job. A person who is out of a job but not looking for one is not counted as "unemployed," but instead is counted as out of the labor force. This definition makes some sense: after all, it would seem peculiar to count those who are happily retired or spouses who stay home by choice as "unemployed." But the definition also raises a legitimate concerns that the drop in unemployment is only in part the healthy sign of a recovering economy, but could also be the unhealthy sign of potential who have given up on looking for a decent job with decent pay. How can we distinguish between these possibilities? One piece of evidence is to look at the reasons that those who are out of the labor force give as to why they are not looking for a job. 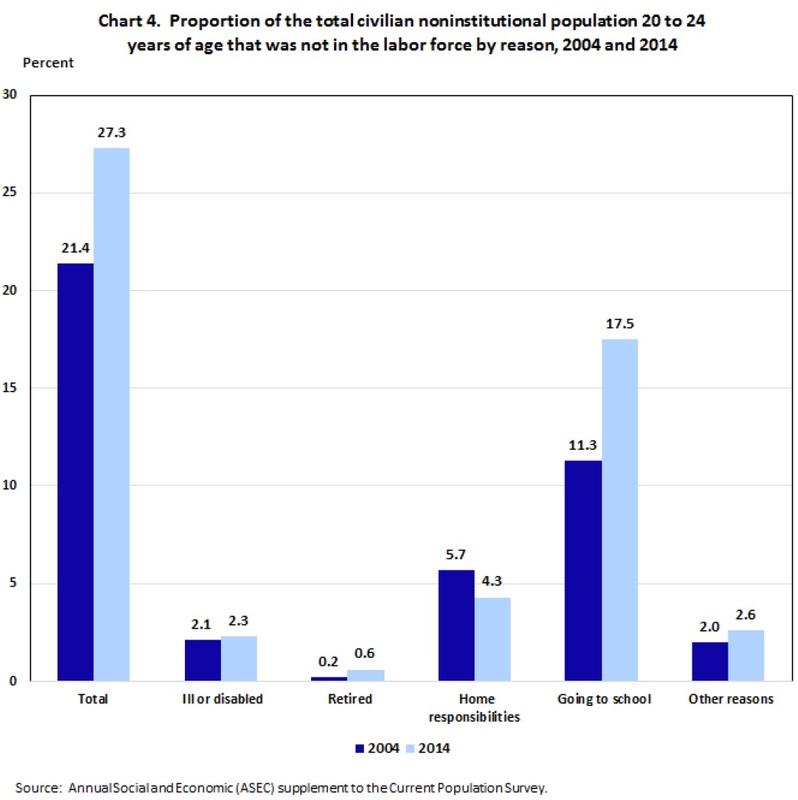 Steven F. Hipple of the US Bureau of Labor Statistics pulls together evidence from a US Census Bureau survey called the Annual Social and Economic Supplement, which is part of the Current Population Survey. "People who are not in the labor force: why aren't they working?" appears in the BLS newsletter Beyond the Numbers (December 2015, vol. 4, #15). As a starting point, here's the overall civilian labor force participation rate. The long rise in the share of US workers in the labor force from about 1970 up through the mid 1990s is usually associate with a much larger share of women entering the (paid) labor force. There's a peak in the late 1990s, and a decline since then, which suggests that the main causes of the decline are long-run, not rooted in the Great Recession of 2007-2009. Hipple breaks down this data in various ways. Here, I'll focus on some breakdowns by age and gender. First, the age groups from 16-19 and from 20-24 have seen large declines in labor force participation, as shown in the figures below. In answers to Census questions, Hipple points out that basically all this decline from 2004-2014, at least, can be accounted for the larger number who say that they aren't looking for work because it would conflict with school. Here are Hipple's charts for these two age groups. Of course, economists are always suspicious of answers that people give in response to survey data. When people in the 16-24 age bracket say that they aren't looking for a job because they are going to school, are they saying that they just aren't attracted by the jobs on offer? If they had ready access jobs that paid (say) twice the minimum wage were readily available to them, maybe more of them would squeeze some time into their schedule for part-time work. It also seems to me that there's a change in cultural expectations here about whether high school and college students are expected by their peers and parents to find at least a part-time job. But overall, the decline in labor force participation by these young adults because of going to school doesn't strike me as a major social problem. 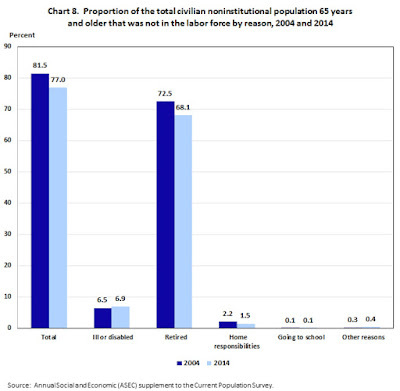 At the other end of the age distribution, here's the labor force participation rate for those 55 and older. It steadily falls until the early 1990s, largely as a result of people retiring earlier, then steadily rises up to about 2010, and since then has leveled out. Hipple's survey evidence compare 2004 to 2014, a period when labor force participation among older workers is rising. 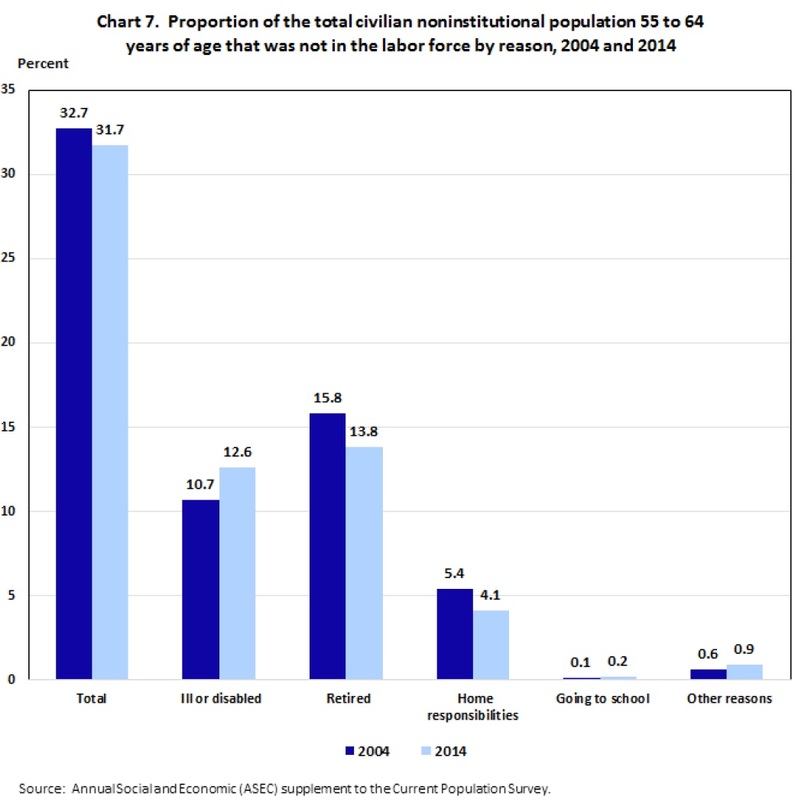 The survey evidence is that older workers are less likely to say that they are out of the labor force because of retirement or home responsibilities, but more likely to say that they are out of the workforce because they are ill or disabled. Here are Hipple's figures for the 55-64 age group and then 65 and over age group. 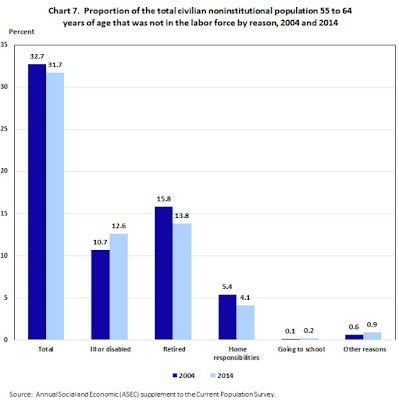 From a medium-run perspective, surely one of the group's hardest-hit by the Great Recession were the near-elderly who lost jobs and ended up forced into retirement several years earlier than expected. Many in this group also found that in an economic environment of low interest rates, their savings brought in less interest income than they had reason to expect. But from a long-run perspective, the pattern for labor force participation of those over 55 is consistent with two counterbalancing factors: on one side, average dates of retirement are moving back and people are working until later ages, which tends to raise labor force participation for this group; but on the other side, the share of the over-55 population that is well past the common age of retirement is rising, which tends to lower labor force participation rates for this group. Finally, what about those in the 25-54 age bracket, sometimes called "prime age" workers? In some ways, when the issue is whether the fall in unemployment is just masking people leaving the labor force altogether, this age group is of greatest concern. This group shows a steadily rising labor force participation rate from 1950 up to about 1990, then a levelling out of that growth in the 1990s, and decline since about 2000. 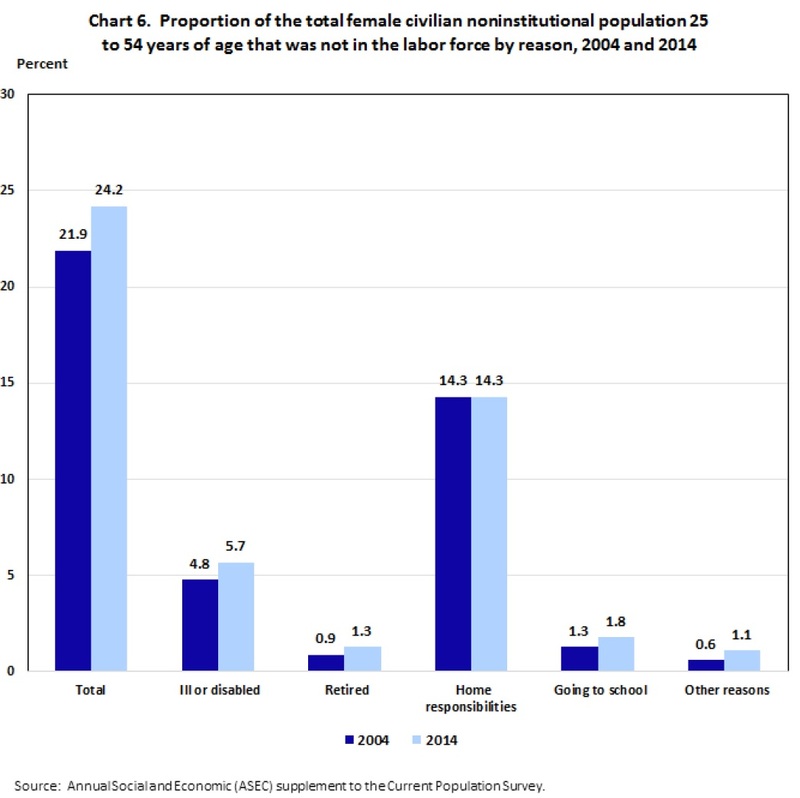 In this case, Hipple's discussion emphasizes the different reasons given by men and women in this age bracket as to why they are out of the labor force. 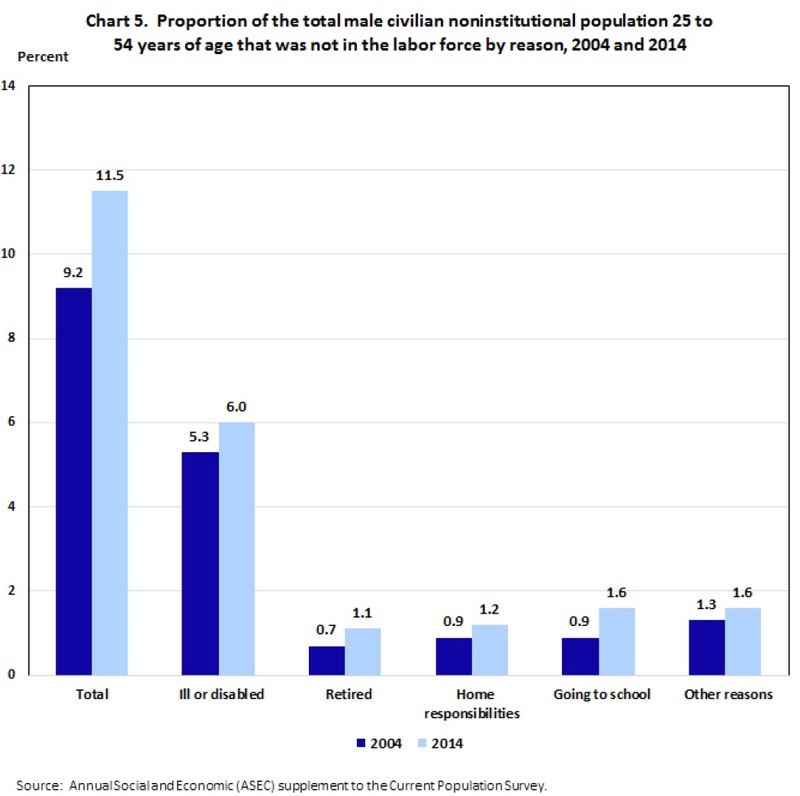 Men mostly say that they are out of the labor force because they are ill or disabled. 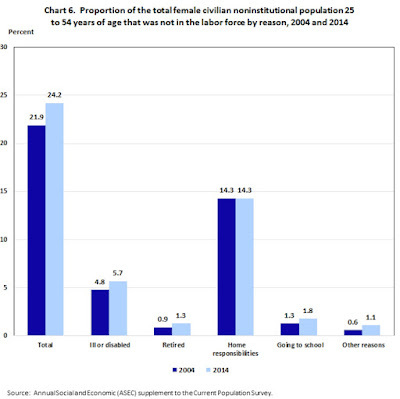 Women mostly say that they are out of the labor force because of home responsibilities. Again, one should be alert the likelihood that the reasons people give for being out of the labor force are strongly shaped both by social custom and the labor market opportunities available to them. For example, one suspects that in 2016, it remains true that it is more socially acceptable and also a more accurate reflection of the division of labor in many households for a woman to report "home responsibilities" as a reason for not working than it is for a man. 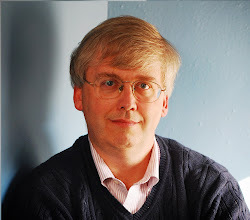 Hipple points out that men with lower levels of education (high school education, or less) are more likely to be out of the labor force as a result of being ill or disabled, and women with lower levels of education are more likely to be out of the labor force as a result of home responsibilities. If more low-skilled men had jobs available that didn't involve a lot of physical labor, it's likely that fewer of them would be report being ill or disabled. If more low-skilled women had decently-paid jobs available, they would have more of a reason to rearrange home responsibilities to suit the job. The reasons people give for economic actions aren't the end of the story, but they do matter, because they tell us something about how people perceive their situations. I've commented on the falling labor force participation rate and its relationship to the unemployment rate a number of times in the past. Here are a few of those posts with various differing angles: For international context, "Putting U.S. Labor Force Participation in Context" (February 27, 2015). For discussions of how to interpret the fall in unemployment rates and the overall health of the labor market in the context of the dropping labor force participation rates, see "How Tight is the US Labor Market?" (October 26, 2015), "Underutilized Labor in the US Economy" (November 24, 2014), and "Unemployment and Labor Force Participation: Revisiting the Puzzle" (July 23, 2014).